Oh, hello there. Look who just hopped in. …they multiplied! And quickly took over the house. Here’s the thing. The bunny-shaped wells in the Wilton pan I bought all face the same direction. When you go to position them back to-back (flat side to flat side) the two bunnies end up facing in opposite directions. So I just took my paring knife and halved each bunny lengthwise so they would all match up. 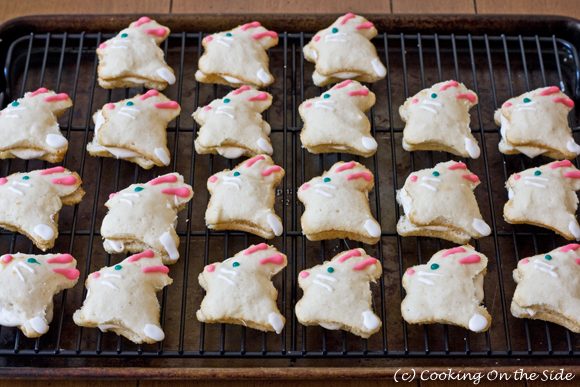 I did end up with twice as many bunnies as I’d originally anticipated (yet still had extra marshmallow filling, go figure) but at least I could now sandwich them. Plus, I think they came out pretty cute. 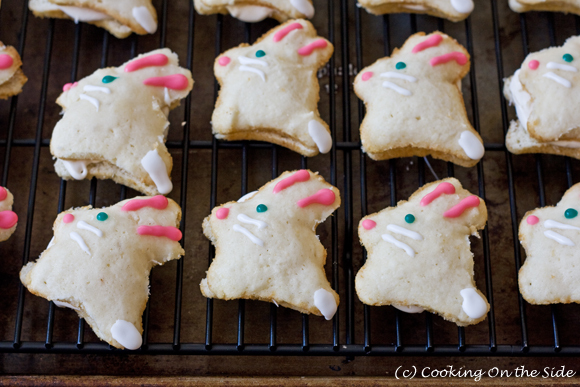 Adapted from the Raspberry Whoopie Pies recipe on the Wilton Bunny Whoopie Pie Pan package. Preheat the oven to 325°F. 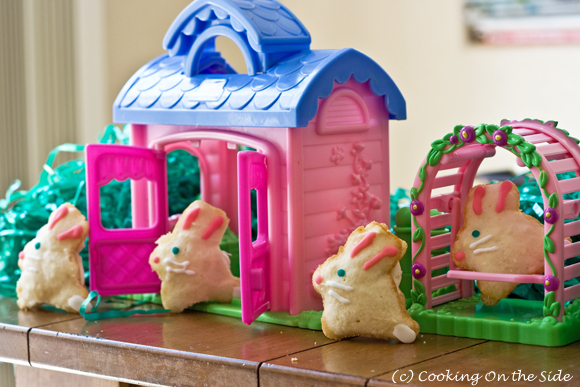 Lightly spray Bunny Whoopie Pie Pan with nonstick cooking spray (I use Pam for Baking). In a large bowl, beat butter and sugar with electric mixer on medium speed until light and fluffy, about 3 minutes. Add egg and vanilla; beat until well combined. In another bowl, sift together the flour, baking powder and salt. Add half the dry ingredients into the butter mixture and mix on low speed. When dry ingredients are almost incorporated, stop the mixer and add the milk. Continue to mix on low speed until all ingredients are almost incorporated. Stop the mixer and add the remaining dry ingredients. Mix on low until just combined. Spoon 2 tablespoons of batter into each cavity; spread batter to the edges. Cavity should be about 2/3 full. Bake for 11-13 minutes or until the top of the cake springs back when touched. Allow the cakes to cool in pan 8 minutes. Remove from pan and cool completely. Repeat for each batch. To assemble pies, carefully split each cake lengthwise to create top and bottom halves. Spread Whoopie Pie Filling on each of the bottom halves. Close each whoopie pie with the top cake halves. Decorate with royal icing or prepared cookie icing. In a large bowl, beat butter with electric mixer until creamy. Add sugar and salt to the butter; mix well. Add marshmallow creme and vanilla; blend well. Use immediately to fill whoopie pies or refrigerate covered up to 1 week. Bring back to room temperature and lightly beat before using. I love it! Those are too fun! Just in time for the April holiday. They look super cute. How could they not turn into multiple batches? The original raspberry recipe sounds good too. Those whoopies are so cute and definitely looks delicious! These are adorable and so unique! OMG I love these! They look so adorable! This totally made me smile this morning! 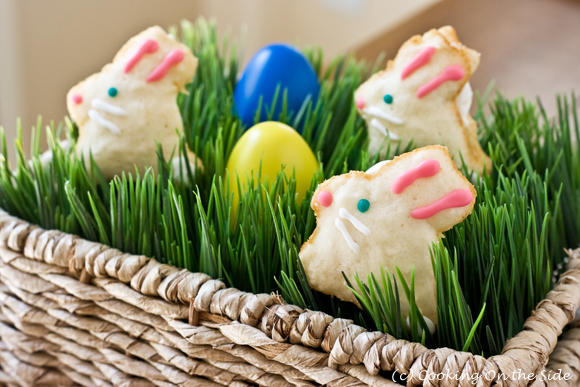 Ohhh… I was looking for a fun spring break baking project and you just delivered one — thank you! Awesome – you can borrow my pan if you want! These bunnies make the cutest whoopie pies I’ve ever seen! 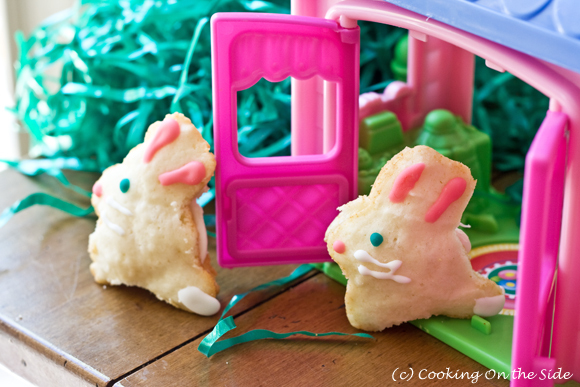 We are hosting a linky party for “EASTER COOKIES & TREATS” and this would be a wonderful recipe to share with everyone. If you would, we would love for you to come link up your beautiful eggs!